Everything 3D: Mac mini. Seriously? I think that buying a Mac is hard. 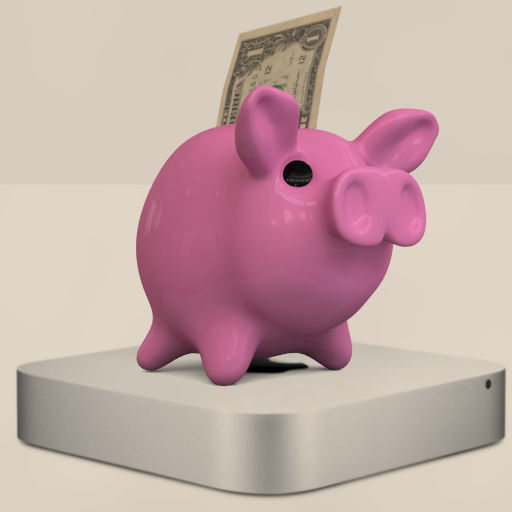 Especially when you don't wanna break the piggy bank by getting a full-fledged, loaded-up Mac Pro. Apple is still missing what I call a mid-range, power-user-wannabe Mac. This would be a decent-sized box with a little bit of room for expansion, and no monitor or keyboard included. I imagine it as something like two or three times the size of a Mac mini, and with just a few expansion slots. Nowadays, if you want to even dream that you might be able to expand your Mac, you either think really really big (Pro) or don't think at all (the rest of them all). Given the configuration of the top line of the most recent Mac minis, I think they are not a bad deal. Perhaps they're even a great deal. I'm gonna try one and see. I have a feeling that I won't be disappointed. For one thing, it comes with a nice CPU (2.5 GHz dual-core Intel Core i5) and a dedicated GPU (AMD Radeon HD 6630M with 256MB of GDDR5 memory). This guy at the Apple Store started eating my head (see if you can figure out what that means!) about dedicated vs. integrated GPUs. He then pointed out that Apple already has a mid-sized Mac with dedicated GPUs: the iMac. To me, it all sounds like a complicated marketing scam: an iMac looks to me just like another monitor in the house, and I've seen plenty of those at the dump lately. However it may be, two days ago I had no idea there was such a thing as a dedicated GPU, but now, here I am, blogging about it, pretending I'm an expert. To the point: a dedicated (or discrete) graphics card comes with its own memory, so it does not have to steal any RAM from the main memory. Additionally, I like the idea of using a low-consumption machine, and the Mac mini seems to be precisely that. I hope that it won't get as hot as the last unfortunate render-engine fodder I was using before. So what else is good about this Mac mini? Hmm... Oh yes, it'll be the second Mac I've ever bought. Actually, the first one, since my first one was a Power Computing machine. Remember those? Up until now I've survived on hand-me-downs. Here's a render to celebrate the occasion.